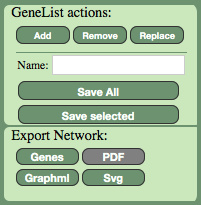 After expansion, add new genes (yellow) to your gene list by selecting them and clicking the ‘Add’ button in the “GeneList actions:” section of the controls below the network. Co-expression values between all pairs of genes across all samples are precomputed and stored in the database. However, it is sometimes necessary to compute co-expression for custom selections of samples (selected using the sample list selector in the menu, note that sample selection is currently not available for all datasets). If the checkbox for sub-network is on, a custom co-expression network of the type specified in the correlation drop-box will be computed on the fly, using the active sample list. 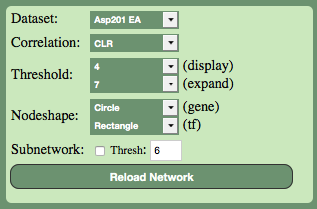 By specifying the minimum co-expression level in the attached ‘thresh’ box you can filter the number of links. CLR cannot be computed for custom sample selections so for this option the network will show MI correlations. Expanding the network. A node selection can be expanded to include all co-expressed genes at a predefined co-expression threshold (specified by changing the expansion threshold in the display settings panel). The network display panel cannot display networks of unlimited size (it is designed to display a few hundred elements (nodes + links), this is due to restrictions on the user’s web client memory). If the network exceeds a certain number of elements, a warning will be displayed and the user will have to raise the expansion threshold before trying again. Pathway nodes. 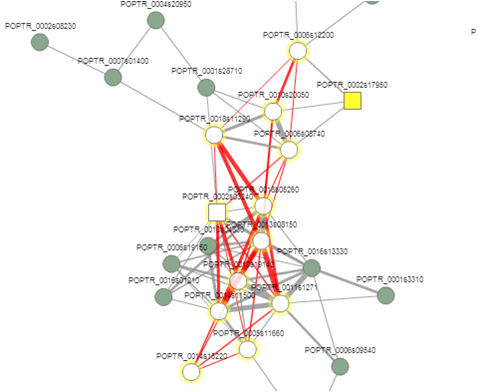 After selecting genes in two or more regions of the displayed network, the Select ptw nodes – option selects the genes in the shortest paths between these initial selections. The initially selected subnetworks can for example be two Gene Ontology categories and the pathway genes are the genes connecting them. Export options. The Genes button exports the gene names in the network as a text file. The ‘SVG’ button exports the current network as a publication-quality figure. 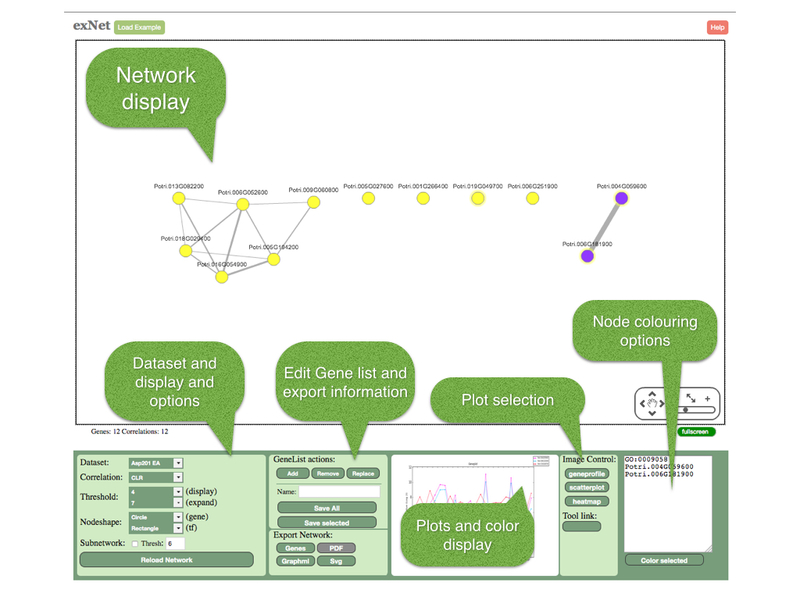 The ‘Graphml’ button exports the network in the graphml format so that it can be further edited in graph editing programs such as Cytoscape and yEd. Three types of plots can be generated for the current network selection: expression profiles (‘geneprofile’), scatter-plots and heatmaps. 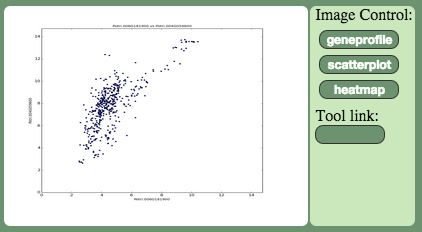 These plots can also be saved (selecting the corresponding button will open the image in a new tab). These plots will automatically refresh as the user changes the gene selection. Gene profile. This button plots the expression profile of the selected genes for the active sample list. 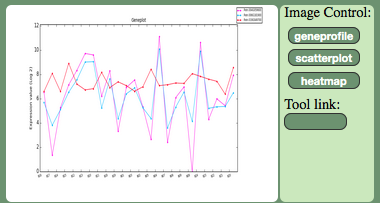 The [‘ExPlot’ tool] can be opened for a more detailed analysis of the expression profiles. Heatmap. The heatmap tool displays a heatmap for the active sample list and the selected genes. A link is also provided for downloading the corresponding expression table. This plot also has a dedicated tool called ‘exHeatmap’, with additional settings and options to generate publication-quality figures. 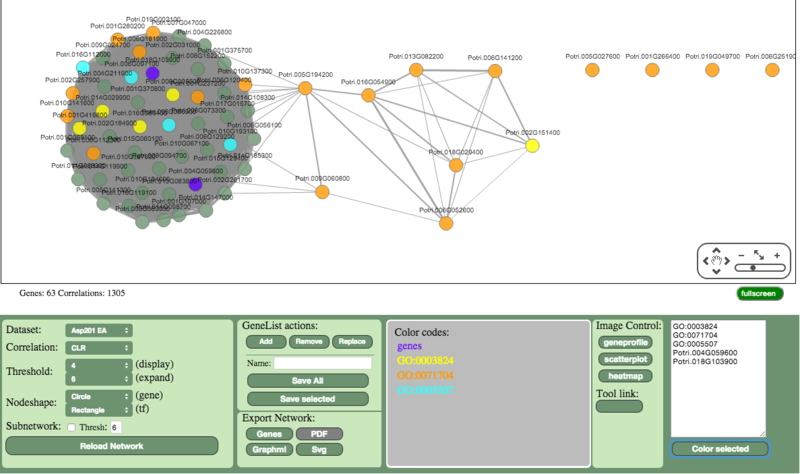 The color panel can be used to color named genes in the network or to color genes from the same GO categories. The ‘GO enrichment’ tool can be used to test the statistical enrichment of GO categories in a selection.